After a day or two of wandering in Adelaide, I have discovered the secret of living here: Don’t work 9-5. During my lunch break, the mall poured with the hustle and bustle of people. I wandered past a little Korean shop filled to the brim. I order a dish of dumplings from a old smiling man at the counter who hand makes each one. 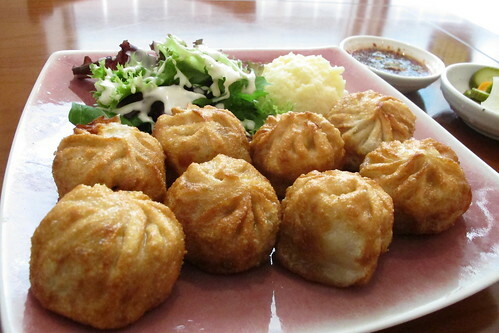 Mandoo dumplings come from Korea, with a slightly tougher dumpling shell than gyoza and filled with meat and/or vegetables. There’s plenty of fillings to choose from like a chocolate box of all sorts. And they’re fresh and delicious. I would have liked to enjoy a mix of steamed and fried and give the kimchi filled ones a go, so maybe next time. After a long search for something, anything that is opened past 5pm on a Sunday… I followed the little whispers past the Mall landing onto Rundle St, a little strip of pubs, cafes and pizzerias. And because sadly I couldn’t devour an entire pizza on my own, I settled for a chicken caesar for one, a coke zero and my Wallpaper guide to Hong Kong. 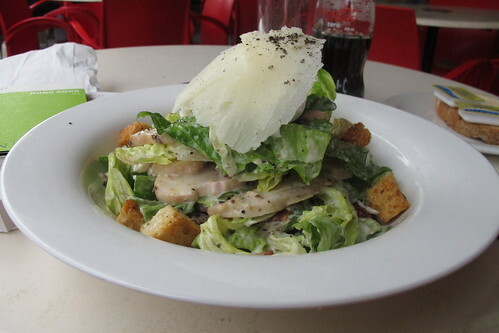 A delicious salad with tender slices of chicken, crunchy croutons and creamy homemade caesar sauce – but definitely trying out the pizza next time. 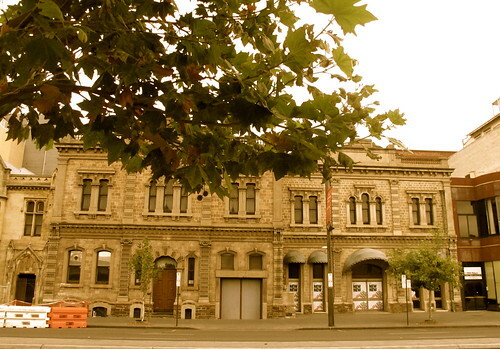 After a few days of Adelaide, I am back! And I am glad to be home to a city that almost never sleeps, with 24 hour emergency McDonald’s, late night Mamak and 7-elevens. In the city with the reputation of closing early, it really is a gorgeous and peaceful place – with churches, ol’ school pubs and zero traffic. Spending most of my time working and on my own, I only managed a little bite here and there…. Bitton has been my latest brunch craze. It’s one of those places where you’re not particularly in the mood to test the waters of something new, and just looking for that quick morning fix of good ol’ favourites. 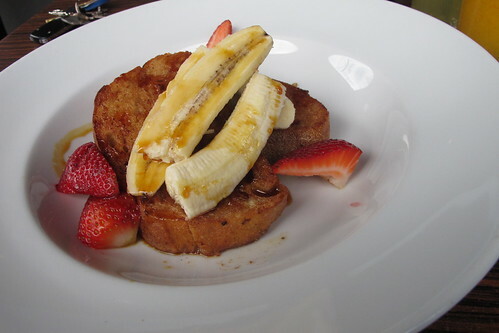 On my first trip (yep, repeat offender already) I indulged in the french toast which was delicious. I’ve only had another memorable french toast experience which was in Lorca, Melbourne and this was has met the benchmark. Loads of fresh and seasonal fruit always helps cut the guilt of having such a sugary delight so early in the day. On my second trip back, I was in an eggy mood, so we opted for the breakfast staples. 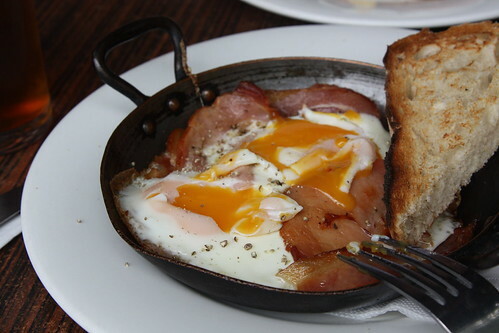 My companion’s poached eggs were delicious, one egg was a little overdone but the rest of the dish was flawless. 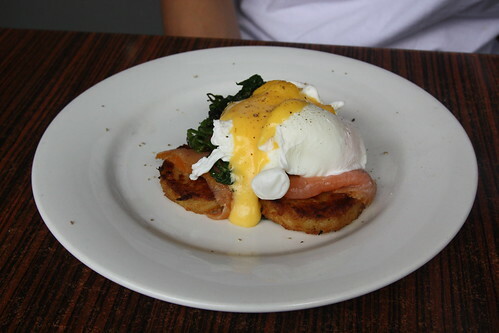 Sitting on a potato hash brown, the creamy hollandaise sauce was just right. 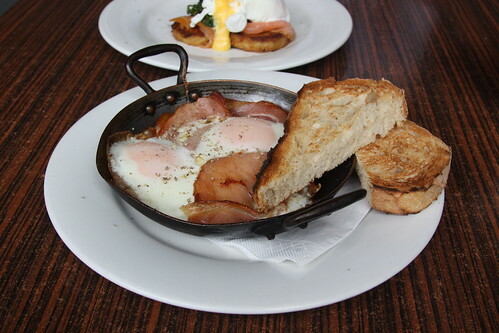 I opted for the one pan and it was filled with goodness, oozing eggs, bacon and 2 slices of wood fired sourdough bread. One of the things that Bitton is known for are their sauces, so the french toast orange jelly is available in the grocer, as well as the amazing spicy tomato sauce that swung my tastebuds into a dancing sensation. Gorgeous view opposite a grassy park, delicious food and great service. Perfect way to start a weekend morning! As a disclaimer to this post, the photos really don’t do it any justice. 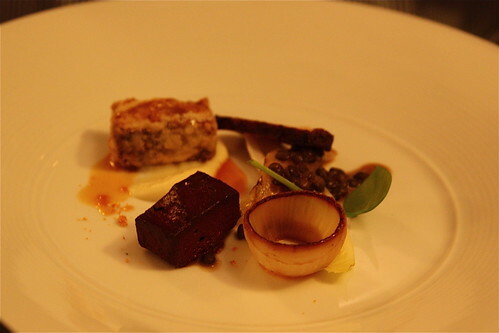 If you love food that is aesthetically pleasing and technical, this is the place to be, each plate was like a piece of art. The front of house is amazing. Embarrassingly, we were over 40 minutes late to our last-minute, only-happened-because-someone-pulled-out and I’m-from-Sydney plea over the phone. Running to the glass doors, a glamorous looking Nanny McPhee like character slid across the floor and opened the door to allow us in. She wore crescent moon glasses on her nose, hair tied in a bun and wore a floor length black trench coat. Without evening mentioning my name, she knew who I was and guided (while she elegantly glided) across to our table. 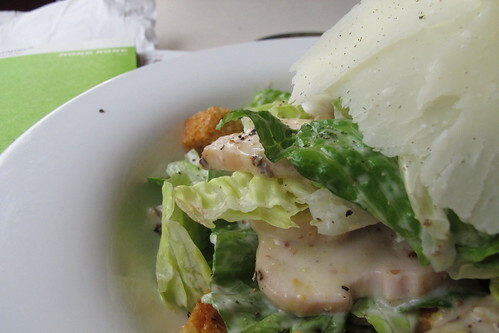 We kick start with a trio of entrees. 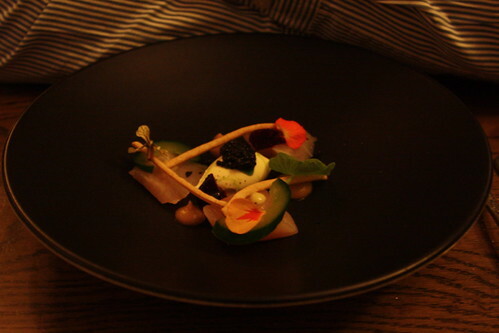 First is a beautiful plate encasing a delicate piece of kingfish and all sorts, it was like inspecting and picking apart a garden with some beetroot here, onion there, crispy rye sticks there…. but it was delicious! Simple, with enormous amounts of flavour, textures which lead to interesting table conversations of trying to figure it all out. Carrot cooked three ways seems to be quite bland on paper, but funnily enough the hardest ingredients to be flavour inventive with are the ordinary staples. 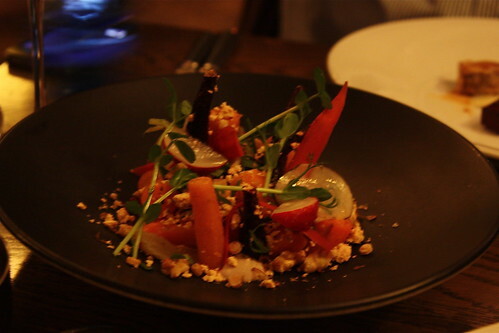 There were raw, cooked by sous vide and picked carrot arranged like a little garden on the plate. Mixed in are walnuts and skanklish, which is a type of cheese, fresh and crumbled, so the flavour was mild and subtle. Our main is a little less artistic, but flavour didn’t disappoint. 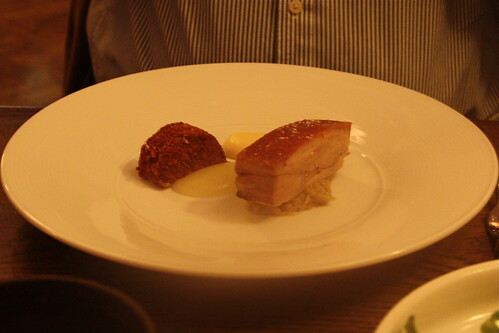 A slice of roast suckling pig that perfectly cooked. What more can you ask for? 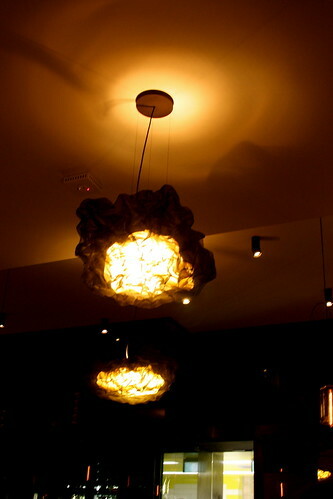 Cutler & Co is a beautiful high-end restaurant but keeps its the quirkiness of Melbourne. Definitely coming back here to indulge in the degustation (and no kidding about the maitre d’ who we still think has superpowers).